Colton Abbott has a secret, one he has been protecting for a couple of months—not an easy task for a man whose family consists of a dozen loving but nosy close relatives (six brothers, three sisters, two parents, and one grandfather), all of whom live in near proximity to one another in Butler, Vermont. For nine years, Colton has lived alone on the mountain property his grandparents bought early in their marriage. He was happy running the Abbott family maple sugaring facility and living in near isolation in the original one-room cabin without running water, electricity, or telephone, but meeting Lucy Mulvaney,best friend and business partner of Cameron Murphy, significant other of his brother Will (All You Need Is Love), has given Colton a new appreciation of cell phones and Internet connections and a greater anticipation for weekends when the six hundred miles that separates him and Lucy temporarily disappears. For the first time since they began spending their weekends together, Lucy is meeting him in Vermont. Colton has the keys to the Abbot family lake house and he and Lucy have four days alone—or so he thinks. He is sublimely unaware that his father’s machinations have ensured that Colton’s secret life is rapidly approaching its expiration date. Lucy is a city girl, born and bred. She likes New York, her job at the web design company she and Cameron founded, and being near her family—her dad, her younger sister, Emma, and her niece, Simone. Lucy cannot deny the spark that ignited between her and Colton from their first meeting. The fact that she, the queen of first dates that go nowhere, has gone to considerable effort to spend six weekends with Colton speaks for itself. But she has been honest from the beginning that she will never follow Cameron’s move from New York to Vermont. When Cameron and Will arrive at the cabin for a romantic weekend of their own and the big secret is revealed in embarrassing detail, Lucy’s insistence that what she and Colton have is only a fling grows more adamant. In spite of her reservations, Lucy agrees to retreat to Colton’s cabin for the remainder of their weekend. She may not be delighted with Fred, the moose, or with Colton’s so-solicitous groupies, but she is charmed by his caring, boisterous family and awed by the beauty of the mountain setting. She discovers she can even survive without phone service and indoor bathrooms. Lucy’s groupie solution and the brotherly banter that results are chuckle-inducing. When Colton visits New York for a week, he finds the city has its own appeal, and the perks of the “pleasure aids and sensual devices” trade show his father arranged for him to attend are definitely meant to be shared. Colton also enjoys Lucy’s family, particularly eight-year-old Simone, but he can’t imagine living in the city. Still, Colton insists that he and Lucy can make things work; however, Lucy can see only heartbreak ahead. 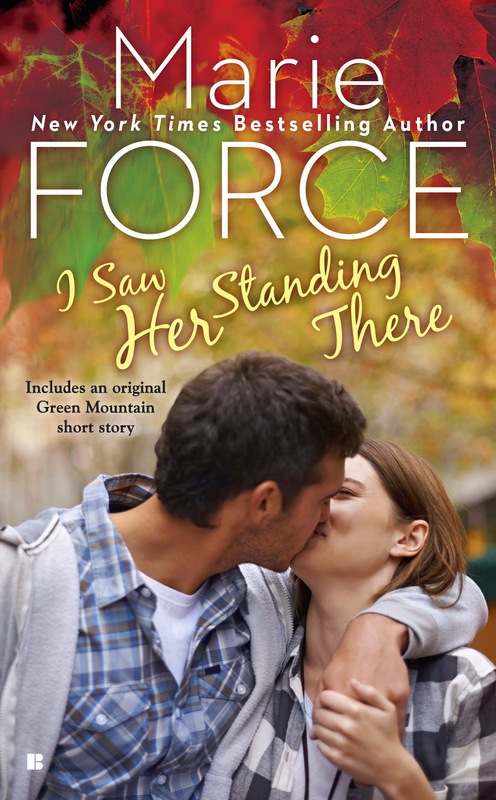 I Saw Her Standing There is the third novel in Force’s Green Mountain series, and Colton is another of her sweet, seductive beta heroes with heart-melting nurturing skills and an off-the-chart H. Q. (Hotness Quotient). Lucy is a shy city dweller with ADD and more than her share of insecurities. With apparently nothing in common, these two fall head-over-heels for one another, but their antithetical lifestyles and the geographical barrier make a happy resolution to their differences seem unlikely. Force avoids the conventional idyllic small town-evil big city opposition and instead gives readers a balanced look at the advantages each choice offers. I also found it refreshing that compromise, which often is absent in romance, played a role in turning this story toward its happily ever after. Force ratchets the sensuality level up a few notches on this one, but she does so without losing any of the appeal of the family relationships and distinctive setting that readers loved in the first two books. Fans of the series will be pleased that Will and Cameron have significant roles in the third book and that the full Abbott family and assorted friends gather for the wedding of Hannah Abbot Guthrie and Nolan Roberts (I Want to Hold Your Hand). Book 3 includes some sigh-worthy scenes for both couples from the earlier books. Despite these strong connections to the first two novels, I Saw Her Standing There can be read as a standalone. Whether your preference is sizzling love scenes, tender romance, close ties of family and friendship, poignant moments, or rib-tickling humor, I Saw Her Standing There offers something to make you fall in love with these characters and their story. A bonus novella, Lucy in the Sky with Diamonds, adds to the humor. I highly recommend this book—and, indeed, the full series, which has quickly become one of my favorites. Book 4, And I Love Her, the story of Hunter, the eldest of the Abbott siblings, and Megan Kane, a woman who has had a huge crush on Will, is set for release on March 3, 2015. It’s on my wish list, and I’m looking forward even more eagerly to seeing more of Ella Abbot and Gavin Guthrie. I’m keeping my fingers crossed that their story will be book #5. Readers, are you city or country? Could you survive without phone service or indoor bathrooms? Do alpha heroes melt your bones or, like Janga, do you have a soft spot for "sweet, seductive beta heroes with heart-melting nurturing skills and an off-the-chart H. Q.?" Are you reading Marie Force's Green Mountain series? Do you have a favorite couple so far? Whose story are you most looking forward to? Deadline to be included in giveaway is 11:59 pm EST, Thursday, November 6th. I am definitely country, however I can not live without proper bathrooms and phone service, I like my heroes definitely ALPHA and I have not read any of Marie Force's books YET, but after reading your blog I am putting her on my TBR list. So thank you. Hope you enjoy Marie's books, Susan. We highly recommend her around here. I can't live without indoor plumbing or phone service for emergencies. I have not read any of Marie Force's books yet. I loved tent camping and cooking over an open fire when I was younger but aging joints have spoken their piece. No more sleeping on the ground for me! I could survive w/out phone service, but not indoor bathrooms! Or internet :) Thanks for sharing! I live right near the Chesapeake Bay. It's lovely, but we want to live in Wyoming. The mountains call to us! There's just something about the majesty of the mountains that touches the soul. Well, I like LIVING in the country ... quiet and neighbor free. But I need indoor plumbing and internet. I have read and love this series. Alpha is my preference in hero's. I don't really have a favorite couple yet, but I really like the moose. :-) I would LOVE to win, thanks for sharing. Country. Prefer my phone and plumbing. Could make it without if forced. Probably a smidgen of a preference for Alpha. Haven't read the series yet. Would love to win of course. Thanks for the possibility. Thanks for dropping in, Lisa! When I rent a cabin, well it's a luxury one. Love this series! I must admit I love both city and country and all of the couples in the series so far. Great review Janga! When I rent a cabin, well it's a luxury one. Same here, Hope. A rustic setting is great but the cabin itself needs to have all the amenities. My days of roughing it are in the rearview mirror. I live in the suburbs but would give country or city a try. I could give up the phone but not the bathroom - outhouse are way too buggy and ice cold in the winter. I definitely love the alphas. I haven't read the series as yet but it sound like something I would enjoy! I could be happy living in the middle of nowhere as long as I have electricity and heated running water.... Oh and internet access. :-) I love to hike and spend time outside, but I do have to have that hot shower. I've only read the first book in the series but I loved it! I haven't yet read Marie's Green Mountain series, but I do enjoy her McCarthys of Gansett Island Series. I'll have to check this one out. As for the other questions, I don't think I'd be happy living in the middle of nowhere without current communication means. Maybe I would have been ok with that when I was younger, but now it would be much too far from the grandkids! Thanks for the review. I knew this series was coming, but somehow missed the first two books. I grew up in the Adirondacks right across Lake Champlain from Vermont. From our spot on the mountain, I could see the Green Mountains of VT and the White Mountains of NH. I really miss it up there. I am still in the mountains, but in TN. City or Country - Both. I appreciate what the city has and like to visit, but I want the fresh open spaces the country offers to live in. Phone and indoor bathroom, could I survive - Yes and I have. I was in the Peace Corps for 3 years and had no phone (or TV) and often did not have indoor bathrooms. Alpha heroes are OK, but a beta hero would suit me best. I need to get this series and read it. They sound like my kind of people. That's one of the few areas of the U.S. that I haven't visited. It sounds beautiful! You really should go. The Northeast is lovely. The northern sections of NY, VT, NH, and Maine sport large stretches of forest, large farms, lovely small towns, Maple syrup & candy, Ben & Jerry's, Lake Placid, and Champ (Lake Champlain's answer to Nessie). The Mount Washington area is nice and you can take the cog railroad to the top. If you like Highland games, the New Hampshire games in September on Loon Mountain are wonderful. We happened upon them accidentally and loved every minute. I could ramble on, but you know what you like and will have to check the area out for what interests you. Great review! I live in the city, but often spent school vacations and summers in the country with my grandmother. I loved the country, but have been a city girl all my life. I could manage a couple of days without modern conveniences, but wouldn't want to spend more than that. I have to have a telephone for emergencies, and I love my indoor plumbing and internet. I love heroes whether they are alpha or beta as long as they melt my heart. I don't think I have read any of Marie's books, but this series sounds like they are must reads. Country, but I still want my bathrooms, telephone and internet services. I look forward to reading this book. I'm a country girl. I love the quiet, no traffic jams. I live 5 miles from a city with a grocery store discount store and drug store. With on line shopping, it's easy to have items delivered to your door. I could survive without phone service or indoor bathrooms but I wouldn't like it on a long term basis or on cold wet days. We like to camp and are frequently without phone service or bathrooms. I prefer alpha heroes but once in a while it's nice to have a comfortable beta hero. I've only read the first book of the series featuring Will's story , ALL YOU NEED IS LOVE. I fell in love with The Green Mountain Country Store and the whole Abbott family. Cameron is out of her element as she hales from NYC but she's determined to design a website for the store. But after her run in with the moose she loses her abhorrence to country life and finds the love of her life in Will. I'm looking forward to reading the whole Abbott family series. I'd highly recommend it. This was the first and only book of Marie Force's that I've read. I am a city person and have always been one. Raised and lived there. Indoor necessities and comforts. Internet, not phone. Alpha heroes. I look forward to enjoying this book. I would like to try country living but close enough to conveniences of a city. I have been living in cities all my life but find them too crowded, noisy and busy now. A nice change is acceptable. I love all heroes who are men, real men. I have to have heat, indoor plumbing and hot water and internet is something that I have become accustomed to now also. Phone is not a requirement. I would love to read this series. I live in a medium-sized city and like that I can be in the country in about 20 minutes. My husband's idea of camping is a luxury cabin or a hotel room and that has rubbed off on me. Beta heroes are my catnip ... love finding a book with a good beta hero! I've read only All You Need is Love so far in this series, so I don't have a favorite couple yet. We live in the country, I could definitely live without a phone and could make do without an indoor bathroom if I had to. I prefer alpha males and have not had a chance to read the series yet. I am definitely a city girl who needs her cellphone and indoor bathrooms! I also need my books, and I think alpha and beta heroes are each wonderful in their own ways. I haven't read this series yet, but it is on my radar now! I NEED MY PHONE AND COMPUTER TOO - AND DEFINITELY NEED INDOOR PLUMBING. SO YES TO CITY GIRL. FOR THOSE OF YOU WHO HAVE NOT READ "I WANT TO HOLD YOUR HAND" - IT WAS A MUST READ. City Girl. I love Betas and my favorite couple is Hannah and Nolan. Nolan is such a sweet Beta. Looking forward to Colton's and Lucy's story. The prizes sound wonderful. Would love to be able to get a b&n certificate that I could use in a brick and mortar store. Country.... and I'm too bossy for an Alpha!! I'm suburb. I could survive without phone service or an indoor bathroom, but I would not be happy. I like alphas and betas depending upon my mood. I have never heard of the Green Mountain series before today, so I haven't read any, but they sound like my kind of stories. I'm a definitely a city girl and I need an indoor bathroom, but I would be okay with iffy phone service. I think I like a mix of an alpha and a beta's qualities. He can be self assured and sensitive. I love the country but live is small town now. I can survive without phone service and bathroom because I have before when I was growing up but its not something I want to go back to now. We live in the suburbs, but I would choose country over city. No bathroom would be an issue! I read the first 2 books in the series, but I don't have a favorite couple. Alpha or Beta heroes are fine with me!